Early in the summer of 1987, Jim was notified that the Academy of Television Arts and Sciences (the Emmy Awards people) would like to induct him into their Hall of Fame. This was, of course, a huge honor and Jim was delighted to accept. In preparation for the televised event scheduled for November 15th, Jim’s team began organizing a script and figuring out what sort of entertainment they should provide. Kermit (performed by Jim, of course) acted as sort of emcee. His job was to introduce video tributes from the different areas of Jim’s life, acknowledging in song that, “For the last months we haven’t been together, because we all seem to work in different places, so I’m a little apprehensive as to whether we’ll all wind up with egg on our faces.” A video cassette machine was on stage and Kermit popped in a tape of The Muppet Show gang from London, people in the New York Muppet Workshop, the Fraggle team on set, and Ernie and Bert on Sesame Street all singing a song called, “Jim is…” interspersed with a few words from David Lazer, Michael Frith and Jerry Juhl. Miss Piggy joined Kermit for the grand finale followed by the requisite commentary from Statler and Waldorf. As the evening progressed, Jim made an appreciative speech and was presented with a large statue inscribed, “His wizardry created the lovable puppets, THE MUPPETS, and endless other characters, who have bewitched millions of viewers the world over for more than 30 years.” His fellow inductees were Jacques-Yves Cousteau, Leonard Goldenson, Bob Hope, Ernie Kovacs, and Eric Sevareid. The event was commemorated with a large caricature of Jim created by the renowned Broadway illustrator, Al Hirschfeld. 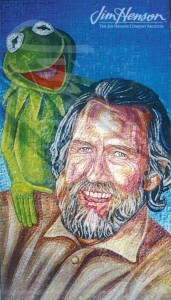 In 1998, a mosaic portrait of Jim and Kermit was installed in the Hall of Fame Plaza at Disney/MGM Studios in Orlando right next to the one depicting Burr Tillstrom, an important influence and friend from the early years of Jim’s career. See Jim’s speech at the 1987 Academy of Television Arts and Sciences induction ceremony. Learn more about Jim’s myriad lifetime achievement awards. 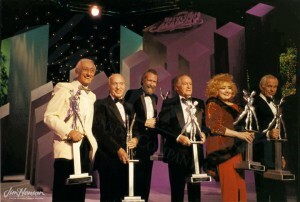 Jim and his fellow ATAS Hall of Fame inductees or their representatives, 1987. Mosaic installed in the Academy of Television Arts and Sciences Hall of Fame Plaza. This entry was posted in 11-November '87, 1987, Honors and tagged Academy of Television Arts and Sciences, Al Hirschfeld, Bob Hope, Burr Tillstrom, David Lazer, Eric Sevareid, Ernie Kovacs, Jacques-Yves Cousteau, Jerry Juhl, Kermit, Leonard Goldenson, London, Michael Frith, Miss Piggy, Sesame Street, Statler and Waldorf, The Muppet Show. Bookmark the permalink.